I'm using a Shimano 9100 crankset currently, with 53/39 9100 series chainrings, but on my last bike I had 53/38 and I loved that combination. I have a 38 tooth chainring to put on, but it doesnt currently fit. While the change from 9000 to 9100 didn't change the chainring bolt position at all (I've checked and they line up perfectly) or the interface with the crank on three of the four arms, the fourth has been trimmed down, to make room for some more material on the crankset. 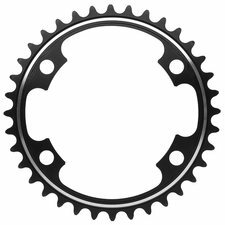 This seems to have been done entirely to force consumers to purchase new chainrings, but they no longer make a 38 tooth in the current series of Dura Ace. Would it be safe to modify my chainring and where would I find someone who would do this? Here's the difference in the chainrings. Shimano might have modified one attachment point to ensure that the ring is oriented correctly. There does not seem to be any differences in the teeth though. As Shimano removed some material, it's obvious that you can. It would be possible to simply mark out the profile of the modified arm, hand file away the extra material and test fit as you get close to the line. Filing with reasonable precision is not as easy as it looks but there are many videos online that show you how it's done. If you need to get someone to do it for you, look up local machining shops. Is bike fit really needed? What inner tube size to get for my road bike? Why is this ring used near the Crankset? 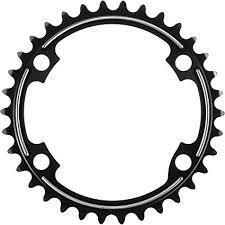 Is there a difference between big chainring and big sprocket, and small chainring and small sprocket? Replace or patch inner tubing? Is it possible to replace a MTB crankset to a Roadbike crankset on an MTB frame?